Looking forward to some island hopping in Greek turquoise waters? Why not choose one of the best small ships cruises along the Greek islands. Here are 3 highly popular, beautiful, and comfortable gulets who can take you on an amazing island hopping experience. The Muhtesem A gulet 32 meter long, accommodates up to 16 guests in Greece and up to 12 guests in Turkey territorial waters. The cabin arrangement with air conditioning comprises 6 double cabins and 2 twin cabins – ideal for multi-family or mixed charter groups. Each cabin en-suite has an enclosed shower, WC, vanity, hairdryer, and shampoo and soap.The aft deck provides comfortable lounging cushions and a large size table with teak chairs for your alfresco dining experience. 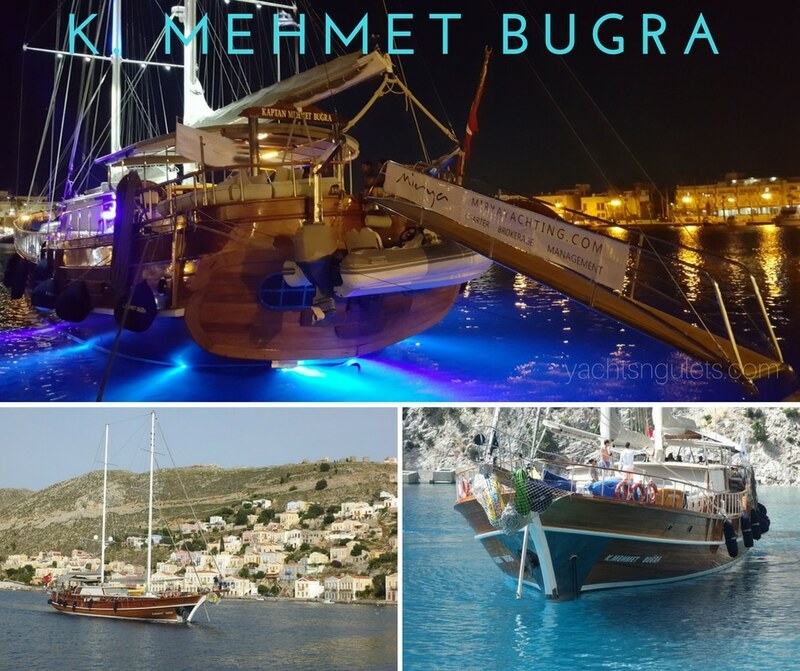 The Kaptan Mehmet Bugra gulet 34 meters long was launched in 2014 and has provided very successful charters since.She was designed to serve you pure comfort and luxury. The gulet features 2 triple, 2 master (with mini fridge) and 4 double cabins. Each cabin is fully equipped with air conditioning, satellite TVs, USB and HDMI connections for connecting your own devices from the comfort of your own cabin. This beautiful gulet offers a whole tray of waters toys.These include a 2015 model 2 person jet ski, wakeboard, 2 pairs water skis, kneeboard, 1 monoski, banana boat, 2 Ringo, paddleboard, 2 kayaks, and other inflatable and floating toys. 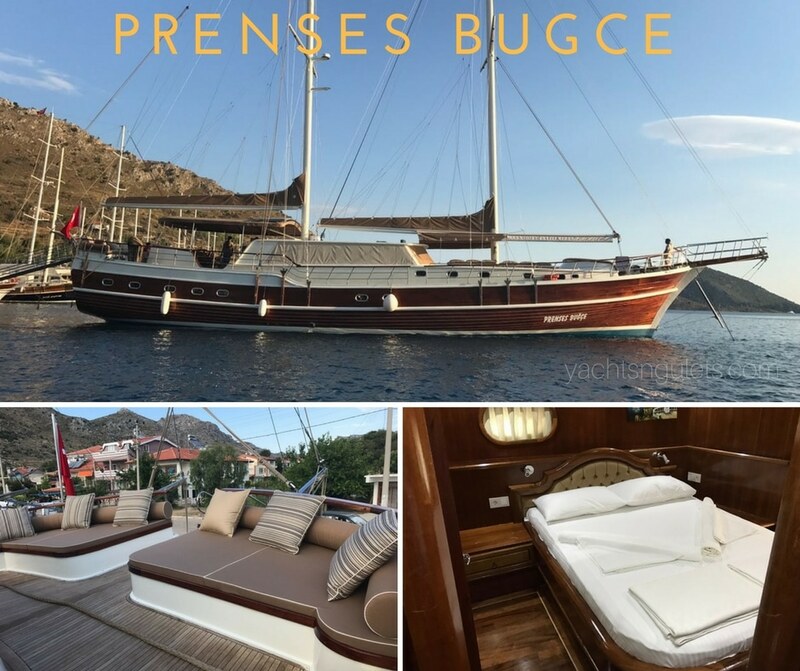 The Prenses Bugce gulet 31 meters long is a beautiful 2017 build vessel available for itineraries along the Turkish coast and Dodecanese islands of Greece. She accommodates up to 12 guests in 6 cabins. Each cabin offers air conditioning and private bathrooms with enclosed shower, vanity, and hairdryer. The spacious aft deck offers large lounging cushions, alfresco dining with mahogany table and teak chairs, as well as service bar. The forward deck has sun-mats for each guest and seating area. The Prenses Bugce gulet is served by an experienced crew of 5. She also features a great selection of water sports toys including paddleboard, wakeboard, a pair of water skis for adult and one pair for children. There is also a Ringo, banana boat, kayak, snorkel equipment and amateur fishing equipment. The inflatable water toys are towed by a 4.90 meter tender with 100 hp outboard engine.